Chris Williams, one of my Christian role models. First of all, among all worldly things there is nothing which seems worthy to be preferred to friendship. Friendship unites good men and preserves and promotes virtue. As the events of the past few weeks play in my mind, I can’t help but think of those wise words. My dear friend Chris Williams went into the hospital about three weeks ago with a sudden illness, and he never got better. As his condition worsened, our prayers intensified, but the Lord did not heal him here on earth. I spent a couple of nights in the ICU with him, and when it became clear that the end was near, my wife and I went to the hospital to say goodbye. While I was there, I talked to his father at length, and I just kept thinking that this isn’t the natural order of things. Parents should not see their children die. But it’s worse than that. 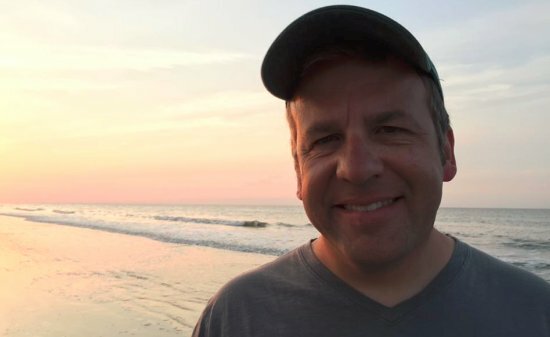 Chris leaves behind a wife and two daughters, ages 10 and 15. Children shouldn’t have to grow up without a father. It’s just not right. He won’t be there to celebrate the milestones in their lives. He won’t be there to cheer them on when they need encouragement. He won’t be there to hold them when they need comfort. You can try to make sense of something like this all you want, but it doesn’t make sense. It’s just not right. So what can be done? Well, the first thing I can do is celebrate the life that he had here on earth. Chris was an amazing man. He was incredibly talented, but utterly unassuming. He was one of my “go-to” actors in our church’s drama ministry. He was best at comedy, but he could literally play any role I gave him. His elder daughter joined him on stage a few times, and they were brilliant together. I will never forget them as father and daughter in A Drama About Grace. Despite his incredible talent, he didn’t think he was anything special as an actor. He just did it because he wanted to serve. I think that was the key to Chris’s life. He was very successful in his career. He was an amazing actor. He was a devoted husband and father. But more than all of those things, he was a servant. He genuinely wanted to make this world a better place in which to live, and he was willing to do that one person at a time. My life was significantly better because Chris was a part of it, and I suspect that many others can say exactly the same thing. This is one of the many reasons I saw him as a Christian role model. The second thing I can do is honor his legacy by being a servant myself, especially to his family. In the coming days, weeks, months, and years, they will have a host of struggles. I hope that I can be there to make those struggles a bit less painful. Of course. He was picking up one of His kids. Think about it this way. Right now, he could be talking to John Newton, asking him what he thought of the play. Kim’s text and the words of my friend encapsulate what makes this tragedy at least somewhat bearable. In the end, I know I will see Chris again, and I know that while we weep, he is in the arms of His Savior. I also know that in the context of eternity, the suffering that has been caused by this tragedy will hardly be remembered. Of course, I do have to admit that I am somewhat anxious about seeing Chris in heaven. If John Newton didn’t like my play, those will be the first words out of his mouth! I have been to too many funerals in the last month and I keep being reminded of 1 Thes 4:13… We do not grieve as those who have no hope. There is comfort in knowing that it’s okay to grieve. And there is comfort in knowing that there is hope. I am sorry for you loss of a good friend. That’s the way I will think of him and the grace that he was in my life. Chris and I had a relationship that was just there. We had a great love and respect for each other, even though we didn’t hang together as often as we intended. We always had a standing coffee date that could be called on any given day – and we did cash in on that when the chips were down. I think I still owe him the next round. So when I see him again, I expect he’ll laugh at my bad joke, squeeze my neck and look me in the eye and say, “How ya doing?” And we’ll sigh together when we leave and say, “Man, I needed that!” Thanks be to a gracious God for bring THAT force named Chris into my life. Jay, thank you for commemorating our friend Chris’s life and passions so poignantly. With you, we mourn the loss of his presence but celebrate his Homegoing and inspiring legacy. Well said Jay. It choked me up a bit. Chris will be sorely missed. Whenever I was at some event representing AU, I could always count on Chris for great conversation to get me out of awkward small talk with others! I also really appreciate folks like Chris who have a genuine, hearty laugh. I’m crying after reading this WONDERFUL tribute of a very godly man. Chris was an amazing man. He always had time for others- never making anyone feel like they were “bothering” him. For many years he would volunteer to do sound for VBS after working a long day. He always supported kids ministry. Was an amazing husband to Kim and a superb dad to Emma and Lucy. One could never know the impact they make on this world. Chris made a MAJOR one who is loved by many. Once again- thanks for sharing this. In regards to his children. This is where various people (including yourself and your wife) can step up and really become aunties and uncles, grandpa’s and grandma’s to the girls. Celebrate his life by doing what he cannot now do. They will go through grief and come out the other side better for it by the comfort and compassion of those who are Jesus (as family) to them. No matter what we have left behind, brothers, sisters, fathers, mothers, sons and daughters, in the Family of God, we gain so many more in Jesus Christ. I have mothers to me and my wife and grandmothers to my children, I have sons and daughters and grandchildren that are not of mine but of the Lord. Again, celebrate his life by being family to his family. Give glory to our Holy God. Broken and moved by your words, Jay. Thanks for them and your heart.